As we headed south from Omorate to Kenya, it was difficult to comprehend the immense difference in landscape that we had driven through in the last two days. 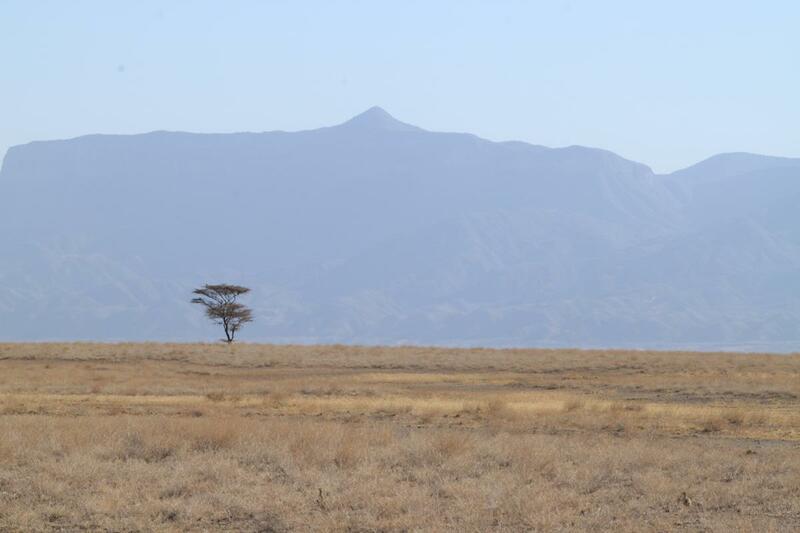 From the lush, cultivated, wet and cool mountainous western highlands of Ethiopia to its dry Omo Valley and now flat and dry land as we skirted Lake Turkana. Passing through some flat, dry countryside. As there was no official border post for this crossing, we reported at the Todonyang Police Station where we were greeted with a hearty ‘Karibu’! We were back on welcoming Kenyan territory and had to mindfully switch back to ‘jambo’ (hello) and ‘asante’ (thank you) instead of ‘salaam’ and ‘amasekanalo’. The road was good, sandy dirt and it was refreshing to drive for kilometres without seeing any villages, only large herds of goat and sheep, each with a herder. 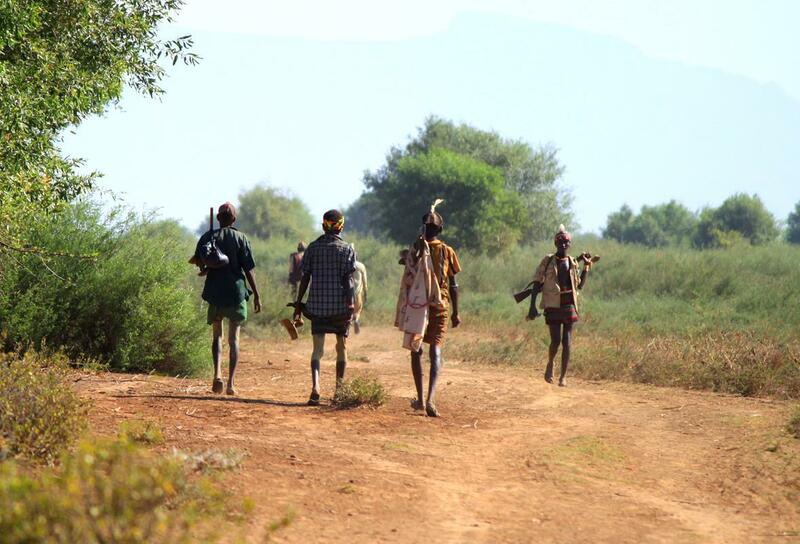 Most of them were armed with AK 47’s as tribal conflict over cattle theft breaks out periodically. Tourists are nonetheless safe. Many of the herders are armed. It was now late afternoon and we started to look for a camping spot after the long day’s drive. Diverting towards the lake down a dry river bed, we were lucky to find a beautiful, reasonably sheltered spot nestled in some acacia thorn. With the full moon rising in the east, we set up camp for the night. 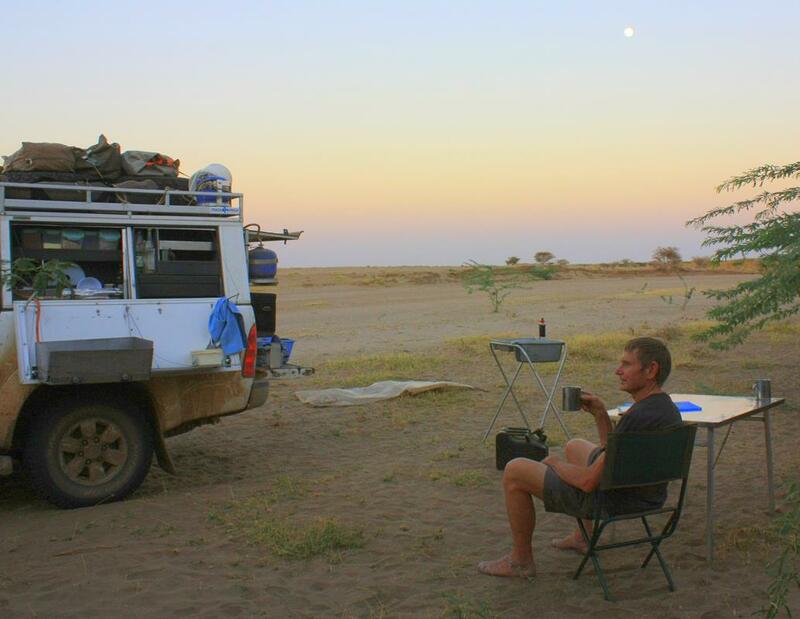 Our bushcamp in the dry riverbed. We had forgotten about the severity of the Turkana winds and woke up to a dust storm. Despite being partially sheltered, everything, including the inside of our rooftop tent, was covered in a fine layer of dust. We could even feel the grit between our teeth! 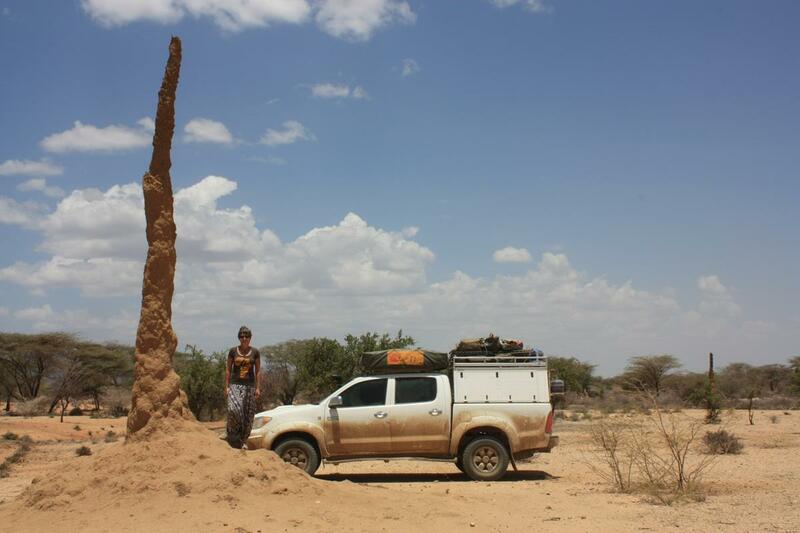 The road condition on the western side of Lake Turkana proved much better than that on the east. 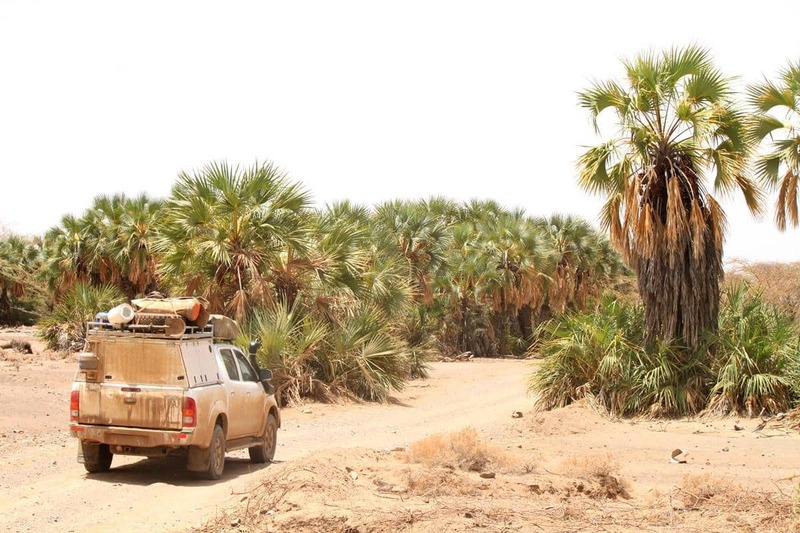 We travelled on a smooth sandy track with many dry riverbed crossings, some of which had small palm oases and waterholes where the people filled their yellow containers. A beautiful oasis in a dry riverbed. 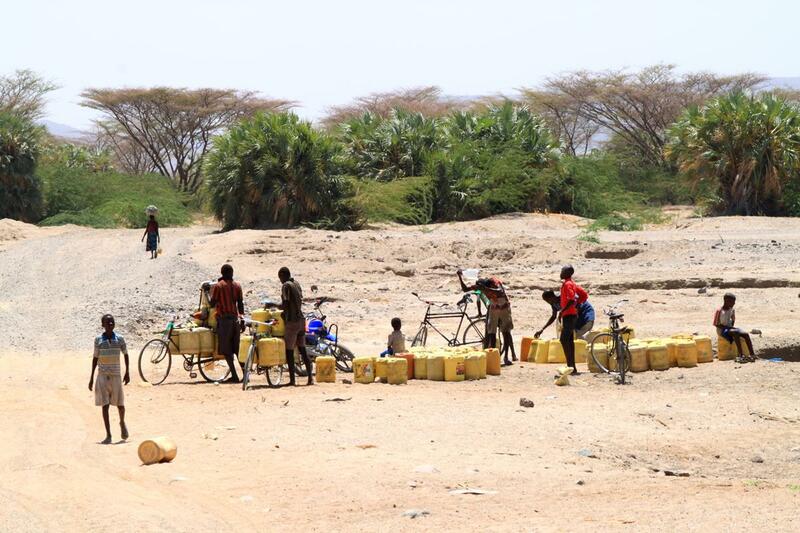 People filling up their water containers at a waterhole. The western side was also cooler but monotonous, dry and colourless, with only a rare glimpse of the lake. A rare glimpse of the lake. 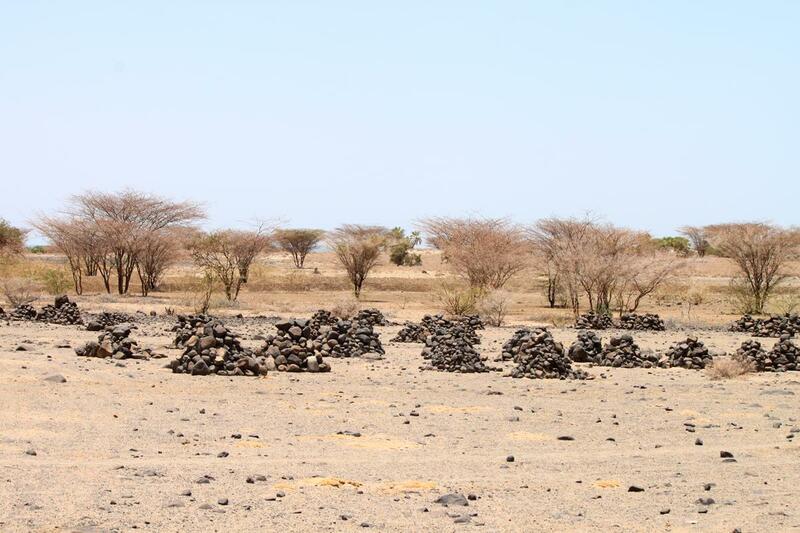 Numerous conical piles of rocks are to be seen next to the road, the purpose of all this labour however mystified us. Piles of rock, neatly stacked next to the road. 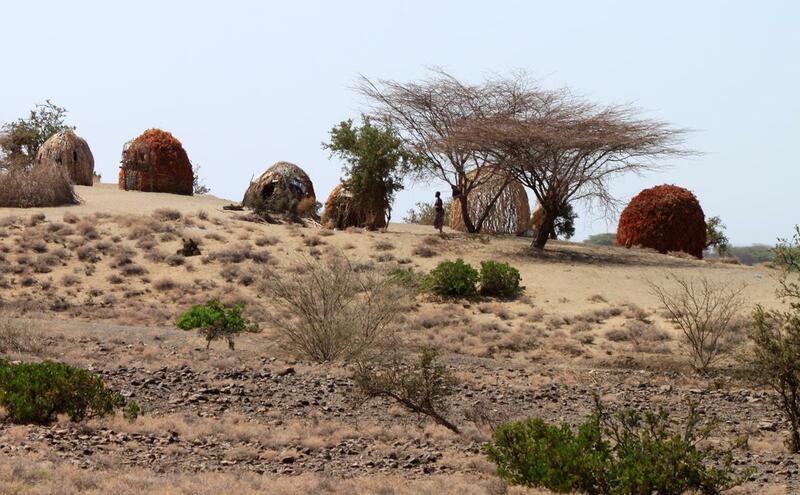 Many of the Turkana women here still wear their colourful traditional clothing, their shelter provided by little round huts, made either from wood or palm leaves. Some people live in wooden shelters. Some of the huts are built from palm leaves. 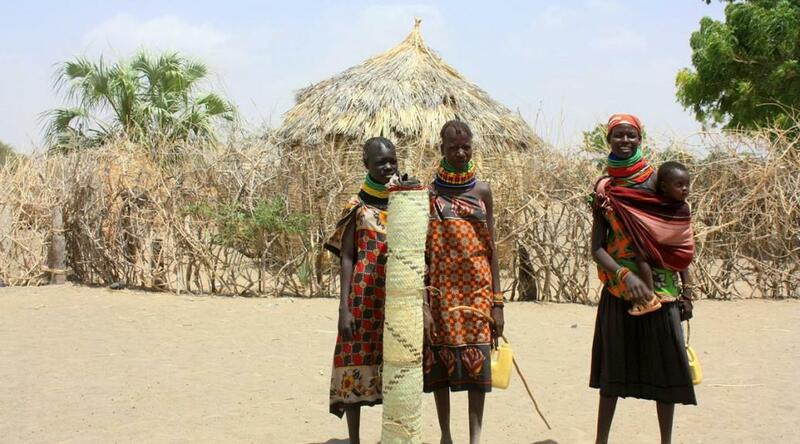 People in one of the traditional Turkana villages. This area is more populated than the eastern side, with many little villages, a few churches and many notices denoting development schemes. 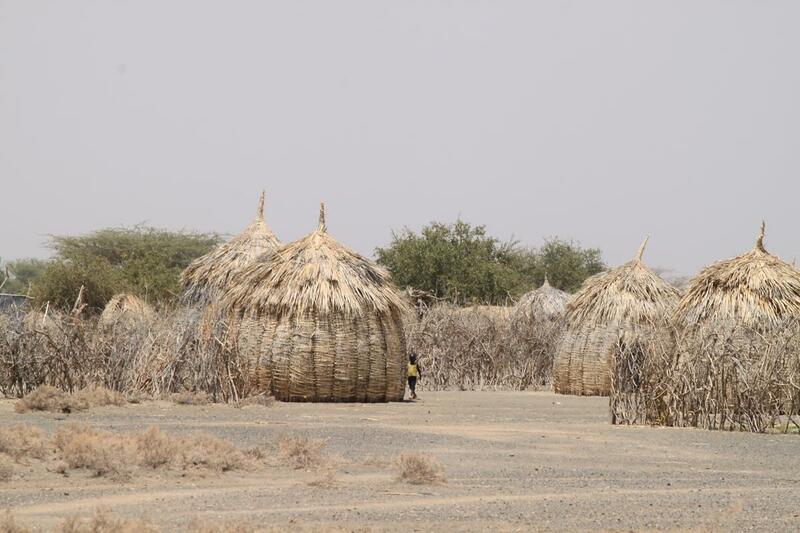 Unlike the east, here Aid Agencies are active to alleviate the plight of the Turkana whom they believe are caught in a trap between global warming, which has made it impossible to farm cattle, and their lack of education, preventing them from more active participation in the economy. 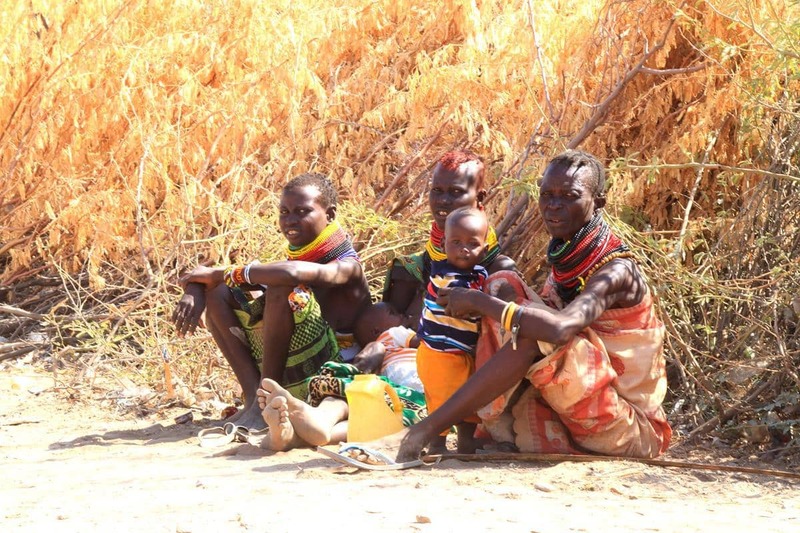 However, I cannot help but wonder how this help from the west will impact on the unique Turkana culture in the long run. 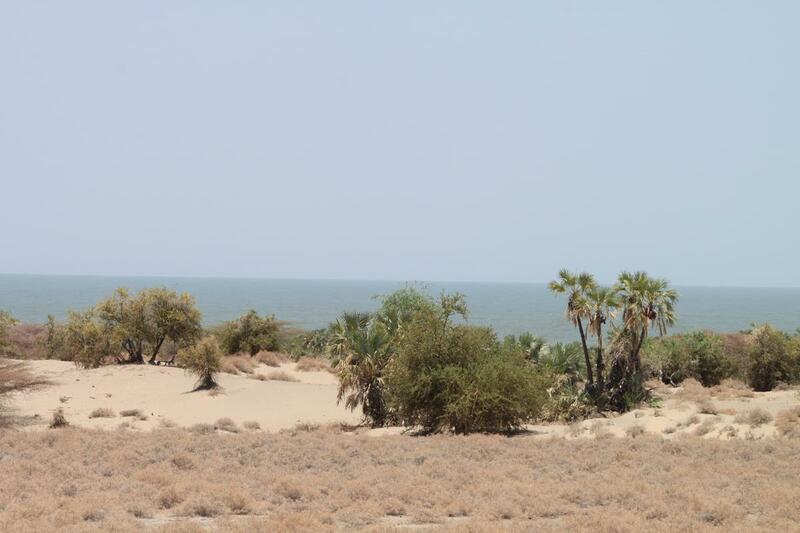 Already the west side of the lake is more westernised than the east side where the Turkana still exist the traditional way and yet survive the harsh, warm conditions. 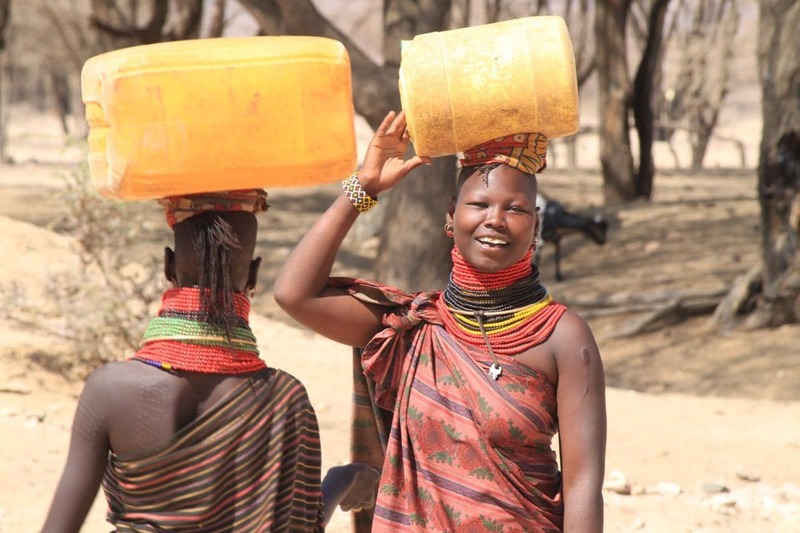 Most of the Turkana women still wear traditional clothing. About halfway down the lake, at Kalokol, the road turns inland, becomes the A1 and immediately takes a turn for the worse. 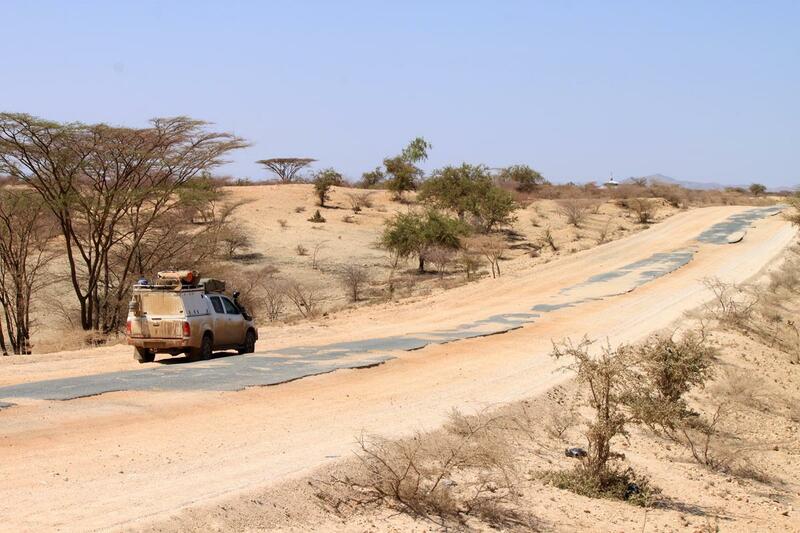 The 58km of broken tar to Lodwar took us ages; everybody prefer to drive on the rough, corrugated gravel strips either side of the remnants of the severely potholed tar. Only a narrow strip of potholed tar is left in the middle of the road. Tired and disoriented because of local road works, we stopped in Lodwar to ask directions to a suitable place where we could camp for the night. Understanding our need, Dennis and Renda (American missionaries) generously offered us a spot in their compound with access to drinking water from their well and the luxury of a modern, clean bathroom with a hot shower. We were extremely grateful for their kindness. 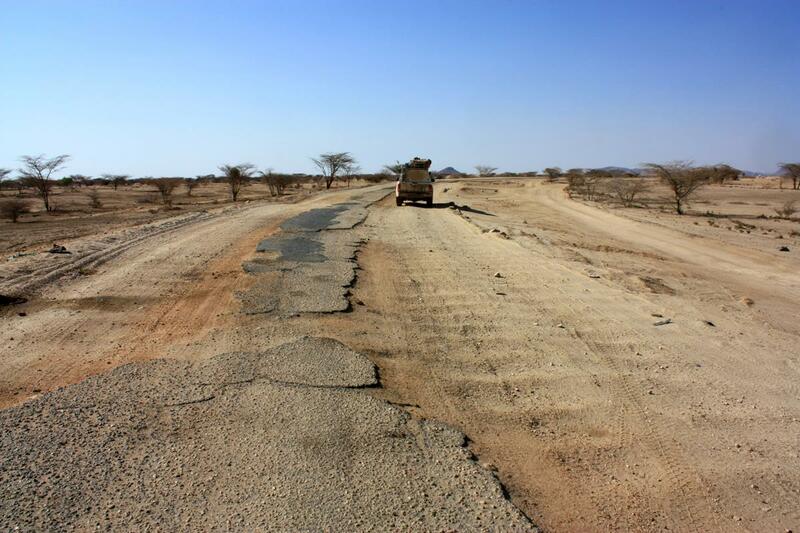 From Lodwar south the road deteriorated still further, taking us 7,5 hours to drive the 196 km to Marich Pass. We never got out of second gear and towards the end often had to shift to first. Many Kenyans travel much faster than we, perhaps not being so heavily laden, but the road takes its toll. We saw many abandoned tyre casings and about a dozen broken-down vehicles on this stretch. The road deteriorated even more. The countryside gradually became less dry and we noticed many tall, slim ant heaps, some as high as 8m. One of the tall ant heaps we passed by. We arrived at Marich Pass in the late afternoon and were so exhausted that the tranquil setting of the Field Study Centre immediately convinced us to take a rest day. In retrospect Ethiopia had proven very tiring, with the constant need to move on due to lack of suitable places to stay over and the difficult driving conditions. This centre, which also offers camping, is situated close to a river, is well wooded with high, shady trees and was the perfect spot for us. As we headed south for Kitale, the road conditions through the beautiful Cherangani Hills remained very bad until the small village of Ortum. Still tired from long days of bracing ourselves in the cab and with Pete’s wrists, arms and shoulder aching from the continuous driving, we were relieved to be on good tar. In Kitale, confirming that one of the rear Monroe Gas Magnum shocks had been destroyed we replaced both and spoilt ourselves with some retail therapy, going to the Nakumatt Supermarket. Being the first time in about two months since we had entered a supermarket where we could find everything we needed, we felt like kids in a candy shop. 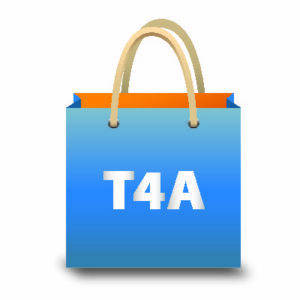 We indulged, buying milk, pork chops, fresh green beans and sugar snaps, none of which we could find in Ethiopia. We also bought some South African wine, just to properly spoil ourselves. The next morning we reached the small border crossing at Suam where we had to simultaneously enter and exit Kenya prior to entering Uganda. Initially this confused the Kenyan officials but after explaining that we had entered Kenya four days earlier at Lake Turkana, and that we indeed had the consent of the Regional Chief Immigration Officer in Eldoret, they processed us. Fortunately we had all the necessary contact details as well as a record of the official at Suam who perhaps failed to recollect that he had been suitably instructed earlier. Once again we had been impressed by the Kenyans officials we had dealt with. Almost invariably they were efficient, polite, welcoming and friendly, as had been most of the citizens we had dealt with. This is in stark contrast to our feelings regarding the fees charged for the Kenyan National Parks. These are so exorbitant that even the European visitors we have met have complained and mentioned how this appears to be drastically reducing visitor numbers, as evidenced by the gate entry records they have seen. We have found that Kenya has so many beautiful areas, many with game, outside of the National Parks that one can experience that ‘Out of Africa’ magic even without entering the parks. Great reporting Karin, I am surely getting hooked on following your endeavors. Keep it up and keep it coming – great adventure.